A 72-year-old retiree from Weymouth is urging others to get a regular eye test after a trip to his local optician saw him receive emergency treatment for a retinal tear, which could have cost him his sight. David Pollington, a former oil and gas service technician, moved to Weymouth five years ago, after purchasing a caravan with his wife so they could enjoy their retirement in a seaside town. Together they have two grown up daughters. It was while he was on one his regular trips to the seafront over the summer, he noticed a concerning change in his vision. “I kept seeing what looked like little midge flies landing on my eyes,” he explains. “I kept trying to brush them off, but they just stayed there. When David started to experience flashes of light, he knew he should have his eyes tested as soon as possible. 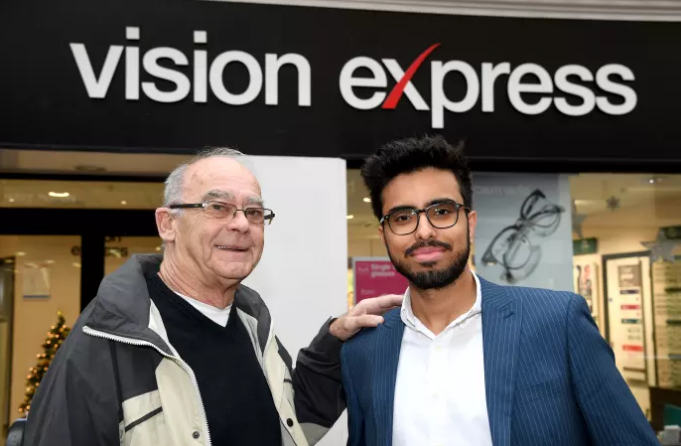 Having been a regular customer of Vision Express in Weymouth since moving to the area, he didn’t hesitate to visit and ask for advice. Vision Express optometrist, Ranvir Rana, says: “David came in to see me as he’d been experiencing floaters in his right eye for a couple of days, with some flashing lights. Ranvir made an emergency referral for David and he was seen the following day at Dorchester Royal Hospital. Due to the amount of blood in his eye, the consultant was unable to see the tear, so they booked him back for a second visit a couple of days later, when they were able to confirm he had indeed suffered a retinal tear in his right eye. He had laser surgery the same day.